It’s easy to make stress a habit in your life without realizing it. How many people do you know who tend to focus on the negative, obsess over what they still have to do, and take on more work than they can handle? If that sounds like you, take a deep breath — it’s possible to unlearn the stress habit and cultivate a sense of serenity in your life instead. Serenity can benefit your life in the opposite of all the ways stress damages it. Feeling calm, centered, and grounded can improve your relationships, make you more productive, and contribute to your sense of well-being. 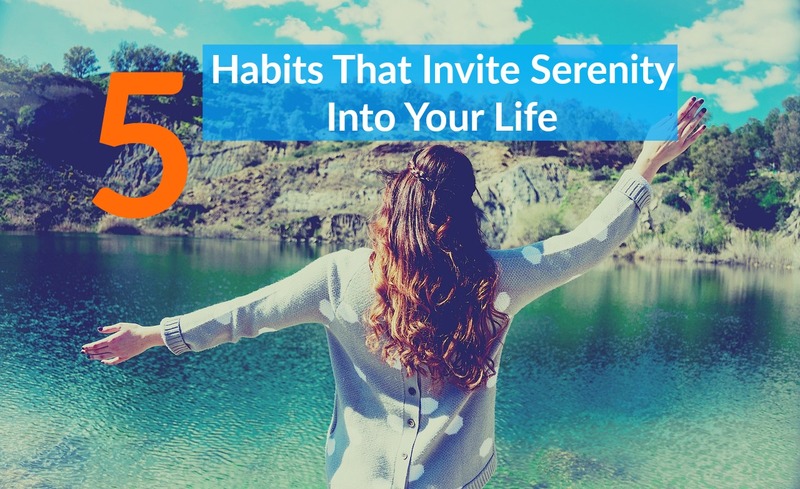 Read on for five ways to invite serenity into your life. If you only add one habit to your day, make it meditation. Daily meditation focuses your mind, makes you feel calmer, and increases your mental discipline. Its health benefits have been proven many times over, and it’s the simplest habit you can adopt. You don’t need books, guided meditation recordings, incense, or any other bells and whistles to get started, just your mind. There are many styles of meditation, but the easiest for beginners is to set a timer for 10 minutes, sit quietly, and focus on your breathing. When your mind wanders, gently bring it back to your breathing. As you get better at clearing your mind, try meditating for longer periods of time. Meditation makes you happier by making you aware of your negative or limiting thought patterns and giving you the power to dispel them. It’s like a reset button for your brain. 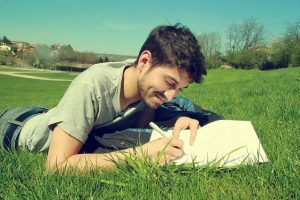 If you associate journaling with the lock-and-key diary you had in sixth grade, think again; journaling is a fulfilling and therapeutic habit for all ages. By getting everything in your head down on paper, you can take a measured, objective look at whatever is bothering you or stressing you out. A journal provides a private place to work on and analyze problems, and it can give you greater insight into your own thoughts and emotions. It’s also fun to look back on a record of the past and see how you’ve developed over the months and years. What’s the most important thing you want to accomplish every day, the thing you’d choose to do if you couldn’t do anything else? Whether it’s exercise, reading, studying, or something completely different, a good morning routine can make it happen and give you a sense of accomplishment for the rest of the day. A morning routine acts as an anchor in your life, giving you the time to pursue what matters to you. Setting up a morning routine might be a challenge if you’re used to hitting snooze and rushing to get ready for work, but like any new habit, you can master it. Wake up early if you need to; it’s a good idea to give yourself at least an hour to get a peaceful jump start on the day. Spending time on your passion as soon as you get up, or just enjoying a cup of coffee and watching the sun rise, sets the tone for the rest of the day and can make the difference between being scattered and feeling energized when you walk out the front door to meet the world. Exercise has so many physical and mental evidence-based health benefits that it’s well worth the time and effort it takes. Regular exercise lifts your mood, makes you feel more capable, and strengthens your discipline as well as your body. You can get some of the benefits of exercise from something as simple as taking a walk, but for maximum effect, try to work up a sweat a few times a week. To ensure you’ll stick with it, pick an exercise you like; there’s no need to force yourself to jog if you’re just not a runner. From swimming to cycling, rock climbing to yoga (read how yoga benefits your mental health), there’s a type of exercise out there for everyone. Whatever kind of workout you pick, your body and mind will thank you for it. You don’t have to be a hippie to appreciate the calming effects of being in nature. We spend so much time breathing recycled indoor air and walking on pavement instead of grass that it’s easy to forget we’re part of the earth. Get in the habit of leaving civilization behind for a while and spending some time enjoying the world’s natural beauty. There aren’t many things more rejuvenating than basking in the warm sun, breathing in the scent of the air after a rainstorm, or observing the way life proliferates in the forest. Nature has a way of reminding us that everything is connected and the little details we worry about don’t matter that much in the big picture. Serenity is a state of mind, and you don’t need to do anything special or fancy to get there. By regularly taking the time to slow down, take care of yourself, and adjust your perspective, you can banish your stress habit and cultivate a lasting sense of serenity. These simple habits can help you get in a calm, clear state of mind more often and unlock your sense of inner peace.